I’ve installed, removed and replaced quite a number of sinks in my day. Recently, I set out to replace the leaky faucet on my mother-in-law’s slop sink. The faucet was 22 years old and the plastic basin was glued to the wall and I just did not want to have to remove it. The supply line bolts were up inside the sink and rusted tight. A standard basin wrench was not going to do the job. The Ridgid Faucet and Sink Installer ($30) is incredibly specific in a clever way. 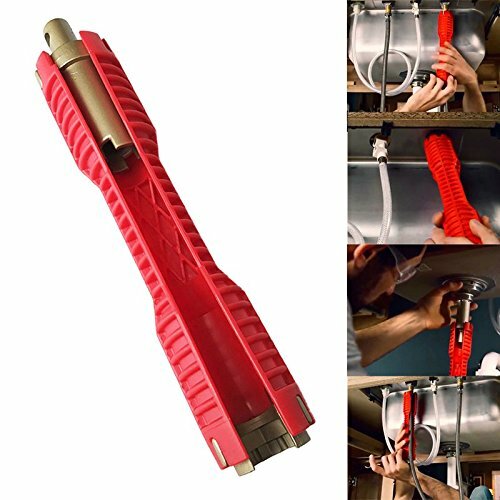 Its two removable and reversible ends have a combination of sizes and shapes to grip all the most common faucet nuts and supply line ends. Looking more like a flashlight than a basin wrench, the orange handle has a slit to fit around the supply lines, and a raised pattern for a good grip. I’m convinced that this wrench, combined with plenty of WD40, saved me the ordeal of having to remove both the sink and the faucet.